Whereas 140,846 people voted online in the last general election four years ago, the final number of e-votes in the ongoing 2015 election was a record-breaking 176,491. That is 35,645 votes more than in 2011, and 42,683 more than in the 2013 local elections. The electronic voting began at 09:00 on February 19 and finished at 18:00 on Wednesday, February 25. 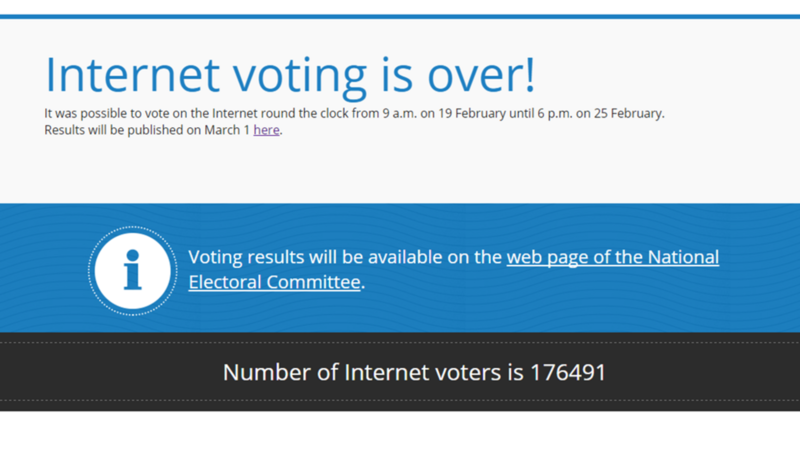 That the vote was in the record course was clear from the very beginning, with the number of online votes given in the first 24 hours almost twice as high as in the previous elections. The pre-voting also ended on Wednesday. According to the official announcement, 119,618 people cast their vote in person during the week-long pre-election period. That gives a total of 296,109 votes so far, or 33 percent of the electorate. That is over 5 percent more than in the 2011 general election (250,043 votes, 27.4 percent). According to the statistics published by the National Electoral Committee, the pre- and e-voting was the most popular in the city of Tartu where 22.6 percent of the constituents have already cast their vote, followed by the city of Tallinn (15.6 percent) and Hiiu County (15.1 percent). The smallest percentage of people have voted in the Tartu County (8.5) and in the Ida-Viru County (9.2). On March 1, the election day, the polling stations will open at 09:00 and stay open until 20:00. People who have put in a request can also vote from home. Compare the number of e-votes with the total number of votes since electronic voting was first allowed in 2005.